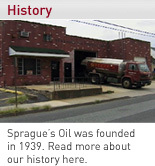 Sprague's Oil heating technicians are available 24 hours a day in the event of an emergency. We provide sales, service, and installation of furnaces, hot water boilers, water heaters, and oil tanks. We sell only the finest quality brands, and stand behind every piece of equipment we sell. Free estimates to replace your heating equipment are cheerfully given. All heating equipment should be serviced regularly. This provides energy savings, may prevent costly repairs, and allows your system to operate at it's peak efficiency. Sprague's tune-up checklist and evaluation is a complete and comprehensive analysis of your system. Does your current heating company provide the same quality system tune-up Sprague's does? These are Burner Service programs which will comprehensively and economically Provide Full Maintenance while complying with the New Jersey State Fuel Conservation Laws. • Perform and record the N.J. State-mandated efficiency tests. Available for Automatic "Keep Full" Accounts Only! Oil fired hot water coverage is available in addition to either the Basic or Deluxe Program at an additional cost. Parts included are those listed under the Deluxe Program. *This Annual Service and Efficiency Test will be performed by appointment only Monday thru Friday from March 1st thru September 30th. • All No Heat calls 20% OFF - During regular working hours.